Today was one of those bad food-blogger days where you wake up with absolutely no idea what you're going to post. Generally, what I do requires a lot of preparation. Planning, shopping and prep work, all taken care of on the weekends. Then I can assemble, finish or bake during the week quickly and with minimal effort. It tends to work well. Well the key words here are "tends to". Sometimes though, things don't go according to plan... recipes turn out to be a little "meh" or worse "bleh". Occasionally I will get all persnickety over the visual appearance of an otherwise fine dessert. Like my creme caramel: "they would look more impressive if they were baked in a smaller ramekin and were taller". My baking OCD can work against me in times like this and I end up refusing to post it. Like bake a layer cake on a Thursday morning. Luckily, this cake wasn't too fussy--well relatively, we are talking about a layer cake here--and it came together quickly and easily. 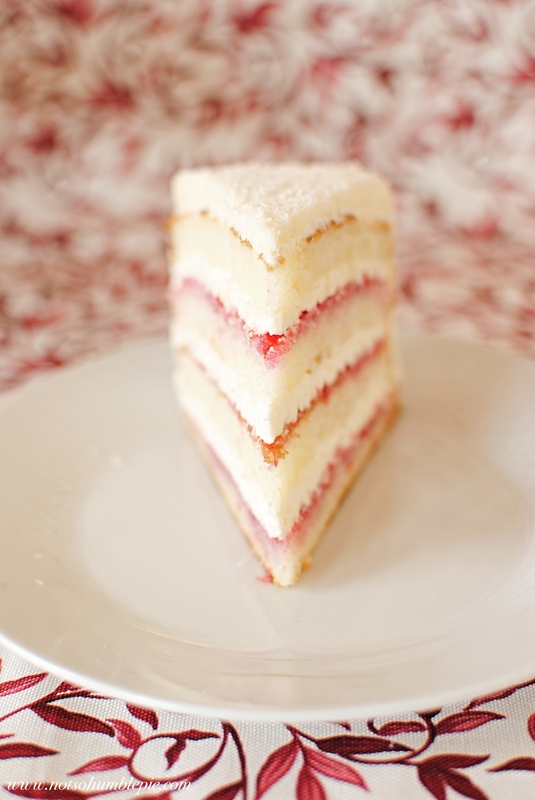 Layers of raspberry preserves and lemon buttercream decorated simply with a little coconut. No piping tips needed. The one thing I hate about layer cakes is cutting them. It always squishes the back of the cake a bit, making my once perfect layers look messy. Bah! Yes, that is my food-blogger/baker OCD talking. When frosting this cake I had to go back and make another half batch of buttercream to get the coverage I wanted for the four 8" layers. So if you're a frosting fiend like myself, or baking in 9" pans, plan ahead and make extra buttercream. Pre-heat your oven to 350°F and place a rack in the lower third of your oven. Coat two 8" or 9" pans with butter or nonstick spray and line the bottoms with a circle of parchment. Place the pans on a baking sheet and set aside. In a medium bowl, sift together the cake flour, baking powder and salt and set aside. In a second small bowl, combine the milk and egg whites and set aside. In the bowl of your stand mixer, combine the sugar and lemon zest and mix for a minute on medium speed until fragrant. Add the butter and cream together on medium speed for 4-5 minutes until the mixture is light and fluffy. Beat in the lemon extract and then grab your bowl of flour and milk. Reduce the mixer's speed to slow and add 1/3rd of the flour. Once moistened, increase the speed to medium and mix until incorporated. Then add 1/2 the milk mixture and beat until the mixture is uniform. Repeat with the remaining flour and milk, alternating until you've finished with the last 1/3rd of the flour. Mix the batter for a further 2 minutes to ensure it is lump free and well aerated. Divide the batter between your baking pans (I think it was a bit over 500g for each pan) and bake for 30 to 35 minutes until the centers of the cake springs back when touched lightly. Place the cakes on wire racks to cool. After a few minutes, run a knife around the outside of the pan to release the cake and remove from the pans. Allow to cool right side up until room temperature. Combine the sugar and egg whites in a bowl over simmering water. Whisking constantly, beat until the mixture is warm to the touch and the sugar is no longer gritty. Remove from heat and continue to beat until you have a thick, glossy meringue. Transfer the meringue to the bowl of your stand mixer with the paddle attachment and beat for several minutes on medium speed. Once the bowl of the mixer feels cool to the touch you can add your butter, one stick at a time beating on medium high. Once the butter is all in, continue to beat for 6-10 minutes. The mixture may seem to curdle at some point but don't worry, continue to beat and it will come together into a velvety buttercream. Once well beaten, you can add the lemon juice a little at a time, beat until absorbed and then adding more. Then add the vanilla and you're ready to frost. For a four layer cake, level and divide the layers with a serrated knife. 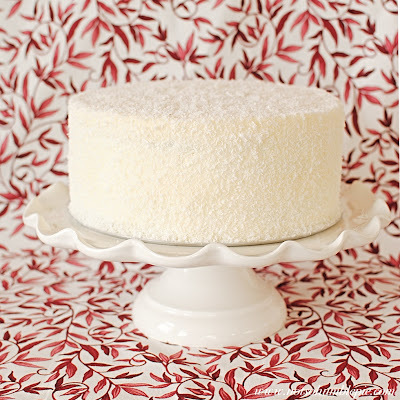 Place the bottom layer onto a cake round (or onto a cake plate with tuck strips of wax paper under the cake to protect the plate while frosting). Spread a third of the raspberry preserves onto the bottom layer of the cake and then a layer of buttercream. The trick to layering buttercream on top of a slippery layer of preserves is to put your buttercream into a disposable piping bag (or ziplock bag) and cut off a 1/3" diameter opening. Starting in the center of the layer, pipe a coil of buttercream. 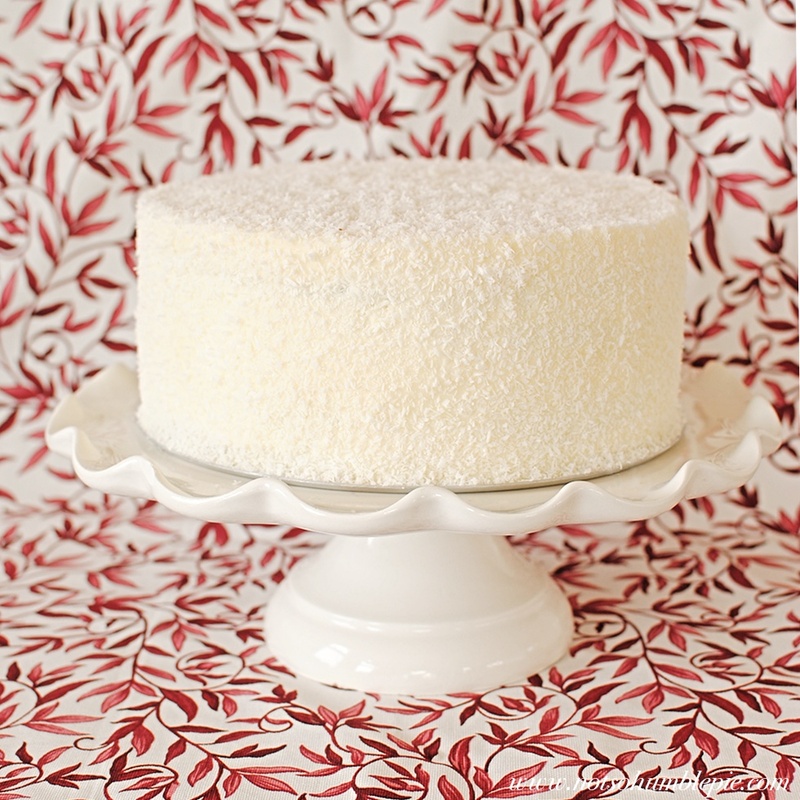 Continue to coil tightly, round and round until you have an even layer of icing on top. No need to spread the frosting with a spatula using this method. Top with a second layer of cake and repeat two more times. Place the last layer on top and then crumb coat the cake with a thin layer of icing. Chill the cake until the icing is firm and then frost the cake with the remaining butter cream. Smooth the remaining buttercream over the cake with an offset spatula until it is level and smooth. 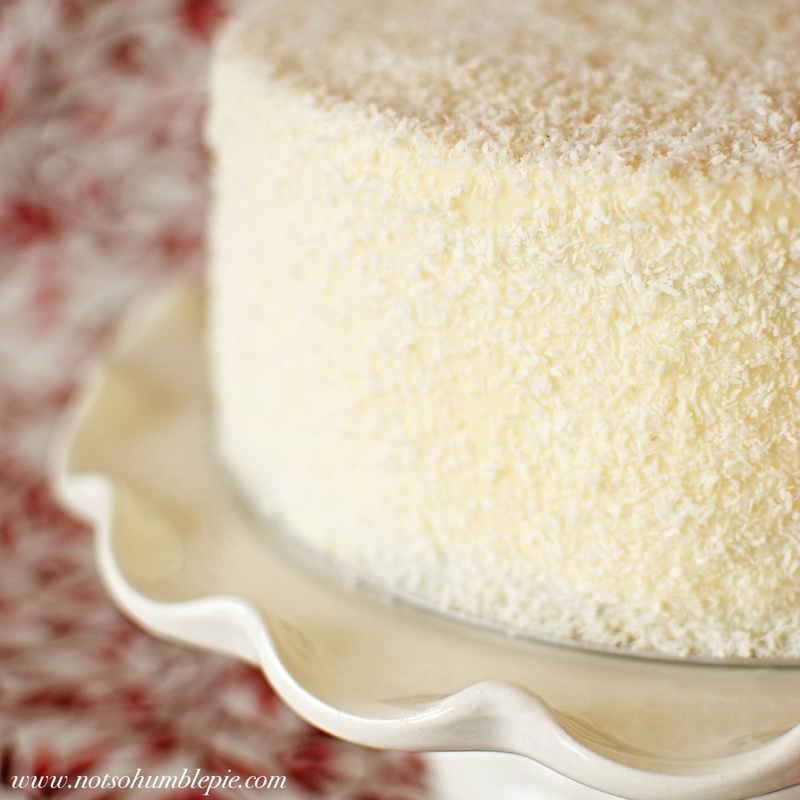 Sprinkle the coconut over the top of the cake and coat the sides by gently pouring the coconut between your hand and the cake. The cake is best eaten the day it is made. If you need to store it, refrigerate it covered for up to two days, allowing plenty of time to bring it back to room temperature before serving. Very impressive for such little planning. This is one of the most beautiful cakes I have ever seen! I made the original recipe of this cake once and... well, it didn't look like this. You may have inspired me to try it again though! Lovely! THIS LOOKS PERFECT!!! i never use all caps, either.... so you know i'm telling the truth. Yum, it looks gorgeous and delicious! Ahhh! This looks heavenly! I must try this recipe.....you are turning me into a dessert lover after all. Thanks, Ms. Humble! Wow. I'm going to have to give that buttercream a try. Not today, though-- I think the chocolate-banana layer cake I made today wants a peanut butter frosting. I hate when I pick on the things that I bake for aesthetic purposes. It's frustrating because I know it tastes good, it just doesn't look quite the way I want it to... Oh, and the squished cake thing bugs me too. Just know that you aren't alone! ms. h...you have outdone yourself...this cake is just UNBELIEVABLE & BEAUTIFUL & SHEER PERFECTION!! &...thanks for the buttercream tip...never knew that!! you MUST publish a cookbook!! YES!!! Can I pretend I'm not on a diet (or that it's a special occasion, like, oh, say, Thursday--Happy Thursday!) so I can try this? AHHHH! I can't believe you linked back to me! Too cool. I was wondering why so many of your readers were looking at my chocolate overload cake haha. Your cake is AMAZING! Oh my goodness! This is exactly what I want right now. You're going to make me do another layer cake hehehe. I love the shot of the first slice. Beautiful. I'm bookmarking this recipe. Yep, that cake looks pretty perfect to me. Ms. Humble- You are an inspiration. Wow! When I see photos of your cake, my cakes suddenly look so....so....bleh. Your cake is simply iced & sprinkled with coconut but the edges of your icing are sharp and your coconut is perfectly & evenly distrubuted. It's amazing. You must take that for granted that you can create such a perfect looking cake. You may claim to have OCD but I guess it helps you to create sensational looking desserts & photos. Two of my favorite flavors in the world are raspberry & lemon. This cake looks delicious. Beautiful job. I bet it tasted like a million bucks. Really? This was a "bad food blogger day?" :) I don't really know if it is possible to call the birth of this beautiful cake the result of a bad day. Wow!! The Cake really looks yummy. Thanks for sharing the recipe. I will surely try this out. Take the Cake Personality Test and find out which cake are you like. I have taken the test and enjoyed a lot. Hope you too will enjoy it. Have Fun!! Ugh. No matter what you make it always looks mouth watering. Now I want cake before 11am. Love the blog! Beautiful Pictures! So simple and clean, makes me want to bake something beautiful to photograph! (its 10 at night here) he he... and to eat. Anyhoo, gots another question for ya Frau H. I don't have a stand mixer, and even without one, there's only so much longer I am willing to wait before trying a Swiss Meringue Buttercream. Do you think I could just wing it with a Pyrex bowl and electric beaters. Please say yes. Unless you thing the answer is no. I mean 'think'. And also, let's get rid of that stray bracket. And add a question mark. Hm, could you use something like unscented dental floss to cut cakes? It's a common tip to use it to cut cinnamon rolls without smushing the ends, maybe it can be a good use for cutting pretty cakes without squashing either? Plus you can find waxed floss so it might not stick as much? Just a thought. It's just ridiculous how beautiful this is. You should feel ashamed of yourself for making us all so envious. Every scrap of blog you have posted is sheer perfection. Just sayin'. Man, what a gorgeous cake. Ms. H... I have to admit... I follow your blog to torture myself. I considered myself a really good cook and a pretty lousy baker - can't stand the details. But ever time I look at your blog I feel like I have never even entered a kitchen. I send your link to other foodie friends and say look! she's crazy! Truth be told I think you're brilliant. I am living vicariously through your blog. Works out for me - no calories :-). and ps... you simply do not have permission to be disparaging of yourself.. even if you do it for humour. You must stop! Your cooking and pics are perfect. Truly. I made this for my sister-in-law's birthday because the Universe told me to. (Truly, she requested "something lemony", and then your post about this cake appeared in my reader). It's a great cake, and the buttercream (this was my first attempt) isn't hard at all. No one should be intimidated by buttercream. That is a beautiful cake! I love anything coconut so I will definitely have to try this! Beautiful! I can so relate to blogging plans gone awry due to meh/blah recipes, but this looks wonderful. I love Dorie's book too btw. And I can totally relate to all the work that goes into the posts and the OCD as well: the life of a food blogger is never simple: and so much work! "No one should be intimidated by buttercream." One should only be intimidated by the amount of butter IN Swiss meringue buttercream. mmmm...that buttercream is rapidly sending me into some combination of bliss and cardiac arrest. I'm a recently-returned-home/unemployed college grad, and my family has been making hints that they are not convinced I learned how to cook/bake while living on my own. A few bites of this cake had them quickly eating their words! We now are making it as a dessert prize for a local raffle. Thanks for the great recipe! I made this cake yesterday and took it to a dinner. Everyone loved it. The only complaint I had was that the buttercream layers were really too thick for my taste and overpovered the raspberry preserve with its buttery taste. Next time (and there surely will be a next time) I'll try to add some more lemon flavor to the buttercream and make sure the layers are thinner (by spreading it on the bottom of the next layer rather than piping it onto the raspberry preserve). Ah! My Buttercream is soupy...what do I do? Where did I go wrong. So far I have followed to a T and I haven't even made it to adding the lemon juice and vanilla yet. :( Any suggestions? I'll be continuing to let it beat and hoping it gets fluffy. Soupy? Has to be the butter. If it is too warm it won't be able to capture and hold the air you beat in and you'll have a bowl of semi-liquid buttercream. Summer temperatures can make butter cream making a bit hairy. Keep things cool, including the butter. You do want it soft enough to whip but only just soft enough to whip. If it starts looking glossy it is probably getting too warm. I am making this cake TODAY!! This cake looks so delicious. I just finished making the cake and will frost it tomorrow for my daughters birthday. I've never made a meringue buttercream before - and I'm wondering if it's stiff enough that I could pipe out those wonderful 1M roses that are all over pinterest and they would stay. Or is it too soft and the peaks would fall? Looks fantastic! I´m so making this!! I love Swiss meringue buttercream, lemon, raspberries & coconut! I think Ièll have to make this cake, or a variation of it using fresh raspberries to decorate the top ~ thank you for posting it to Pinterest :-) I found it via another pinner. Hated this cake. Please don't take it the wrong way, just one person's opinion. I hated it from the time it stuck to the bottom of the pan like glue (yes, should have used parchement) to the flavor (not really all that lemony) to the dry texture and the way the stupid thing was so crumbly. (this with 30 min in the oven) Just all around awful. I'm no pro, but have cooked a few cakes from scratch in my day. Not taking it the wrong way and I am sorry it didn't work out for you. This is one of Dori Greenspan's recipes--a writer and respected kitchen guru--one that several bloggers have reposted and in my kitchen, like in theirs, the cake turned out quite well. I found it moist and decadent when paired with the buttery lemon frosting and tart jam.